Any moment now and you're going to explode in anger! Lock your door and give warning to the people outside. 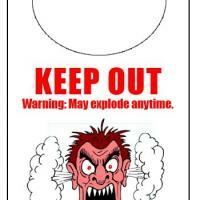 Print this mad mood door knob hanger and hang it on your door.